Washington, DC, is a city that holds culture and the arts close to its heart. When the stereotypes and outside-the-beltway misconceptions about what this city is—political infighting, opportunistic staffers, the rat race of governance—are dismissed, the District shines as a city where art, theater, and literature are woven seamlessly into day-to-day life for many. Accessibility is a hallmark of the arts scene here, and what that means in practice is clear from the first time you see a toddler splashing through a fountain at the Portrait Gallery: culture is an unfussy and real part of this city’s fabric. Literature is no exception, with a wealth of independent bookstores scattered across the city. Among the largest names in the bookselling business, a few commonalities can be found. They are designed to be comprehensive hangouts, with restaurants or cafés, free readings and events, and a warmth that encourages lingering. Politics & Prose is the most iconic of these, and for good reason. It has set the standard for bookstores in DC, carving out a space for itself as an all-in-one literary experience. Opened in the far north neighborhood of Chevy Chase in 1984, Politics & Prose is off the beaten path, far from the Mall and monuments. But it has become a favorite of book lovers around the district and the world all the same, a necessary stopping-off point for the bibliophile. Even President Obama has made the trek north to peruse the shelves. And there is much to peruse—the shop is organized but mazelike in its treasures. But Politics & Prose offers more than just books, as all great bookstores around the world do. The Den, a basement café and restaurant, is a favored place of readers, workers, and coffee fiends, with at least a few open laptops occupying tables at any given time. It is a place to sit, enjoy the quiet, and be part of the shuffle of the day. The shop offers a self-publishing program through Opus, a meaningful way to support local writers alongside the literary giants and undersung voices the shop carries. District Lines, an annual anthology, collects work that speaks to the culture, people, and reality of DC, ranging from photography to poetry to fiction. One look at the shop’s event calendar shows that there is always something going on—readings, panels, discussions, classes. 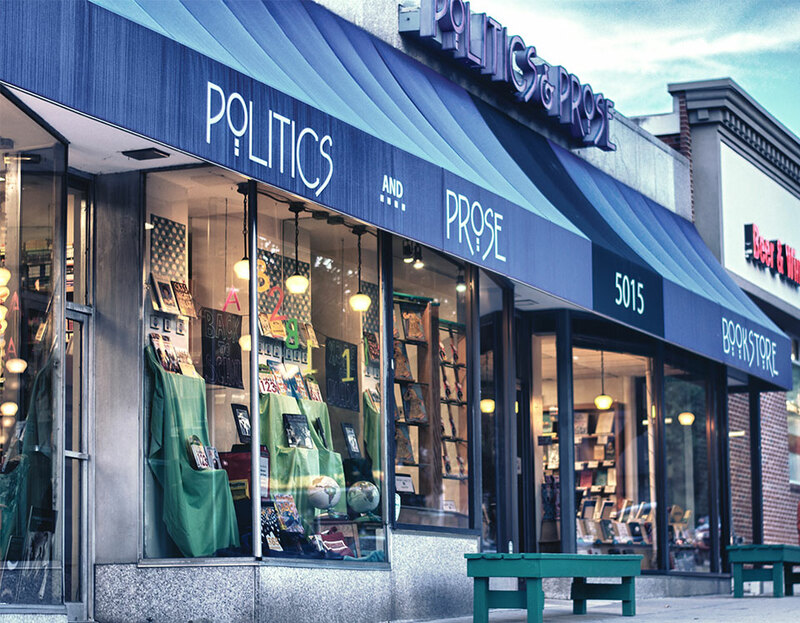 Politics & Prose has become a must on book tours passing through the area, hosting politicians, celebrated authors, and writers of all stripes. All events are free and open to the public, and most are held at the back of the store, integrating the action with the shop itself. Any given week will see writers in conversation with the public about their latest works of literary fiction, memoir, political history, or local culture. That, more than anything, speaks to the role of culture in this city. The openness and the availability of cultural programming such as that offered by Politics & Prose creates an intimacy between the city and the arts. The District is known as a hub for power, ambition, and all the attendant pitfalls. But it is also a hub for culture, where the arts are a source of community, welcoming the city’s many residents and visitors with open arms. Bridey Heing (brideyheing.com) is a contributing editor to World Literature Today and a freelance writer. She has reviewed for the Times Literary Supplement, the Economist, the Daily Beast, and others.